EuroHoster Review 2019: Is EuroHoster a Good Hosting? EuroHoster, founded in 2015, is a Bulgarian company providing virtual private servers and dedicated server rentals. It has 24/7 customer service and affordable pricing. EuroHoster is a new website hosting company which was founded in 2015. A Bulgarian company, EuroHoster provides virtual private servers and dedicated server rentals. Its website is available in English, Bulgarian, and Russian. EuroHoster offers a wide selection of virtual server plans, dependent on the location of the servers. For example, it offers three plans with Bulgaria-based servers, six plans with servers located in the Netherlands, and three U.S. plans. To give you an example, the three plans based out of Bulgaria are Start, Medium, and Fast. The smallest plan, Start, includes 1GB RAM, 10GB SSD RAID10, unlimited traffic, and ten IP addresses, the Medium plan includes 2GB RAM, 20GB SSD RAID10, unlimited traffic, and ten IP addresses. The largest plan, Fast, includes 3GB RAM, 40GB SSD RAID10, unlimited traffic, and ten IP addresses. All of the plans (VPS) are activated within a few minutes, use solid state disk drives for disk read / write speeds up to ten times faster, stop, start, reboot, and VNC console for the remote access. 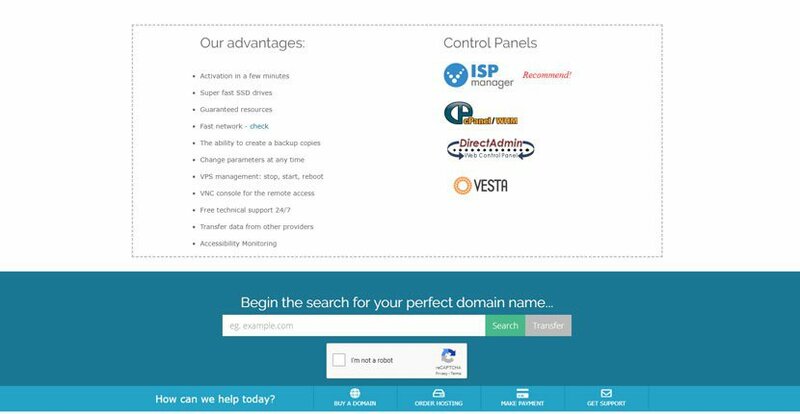 Customers can choose between cPanel, ISP manager, Vesta, and DirectAdmin control panels. Finally, what’s really interesting is EuroHoster’s flexibility. Although it offers base configurations, you can customize your plan in a multitude of ways during the checkout process. Options included but are not limited to: extra RAM, OS template, number of CPU cores, amount of disk space, number of backups, and so on. The prices are really good when compared to both local and international competitors. You can purchase a really solid VPS for a very affordable monthly amount. EuroHoster also allows you to purchase its plans in one, three, or six month terms. The price is very slightly reduced if you purchase a longer term but nothing too significant. Just be sure to consider that domain registration and SSL certificates are added extras. EuroHoster provides free 24/7 technical support by phone and live chat. There’s also a client only zone, so it’s hard to know if there are more support options available behind the login screen. They have a pretty comprehensive knowledge base as well. I have spoken to them several times on live chat, and each time the operator was helpful, prompt, and well-informed. A new, but impressive virtual private server and dedicated server hosting company. Not only do they offer 24/7 support and excellent plans, their prices are great too! Wondering how EuroHoster stacks up against other Web Hosting companies? Enter any other Web Hosting company and we will give you a side-by-side comparison.